What sort of monument do we leave for real estate developers? For John B. Althouse, who built hundreds of homes in the Wilshire district, as well as the West Adams district and the San Gabriel Valley, the answer might be nondescript offices and vacant lots. Here’s the house he built for himself at Oxley and Fremont in South Pasadena, a few blocks from my home. In fact, I pass the corner every day. Here’s another one he built on Manhattan Place. Don’t rush out to look for them, though. They’re gone, although the wall around Althouse’s home survived. Born in Baltimore, Althouse died in July 1939 at the age of 72 at his home, 230 S. Gramercy Place. He arrived in Los Angeles in 1886 and spent 37 years in the real estate business after operating a fruit store at 1st and Main Streets for many years. 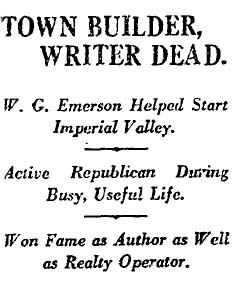 He constructed hundreds of homes in the Wilshire district and was one of the first members of the Los Angeles Realty Board. What’s this? One has survived in the West Adams district, 1415 S. Gramercy Place. Also read here. And here. Zillow link. 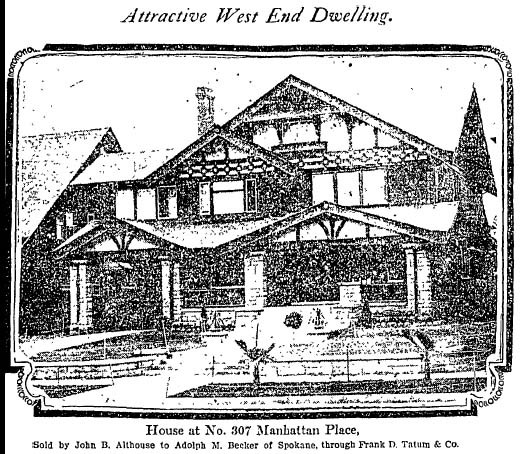 Update: Further research reveals the home of Daniel T. Althouse, a partner in Althouse Brothers, at 2125 S. 4th Ave., where he died of blood poisoning in 1914.